Lar Carpenteri Gibbon (Hylobates lar) is threatened by extinction, with the global population declining by an estimated 50% over the past few years. There is no reliable population estimate for most of the countries in which the gibbon ranges, which includes Indonesia, Laos, Malaysia, and Myanmar. In Yunan – China, Lar Carpenteri is thought to be completely extinct since as early as 2008. In Thailand, estimates indicate there are between 15,000 and 20,000 individuals remaining. 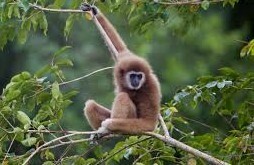 The White-handed Gibbon, as it is also refers to, is threatened by hunting, pet trade, and particularly habitat loss. 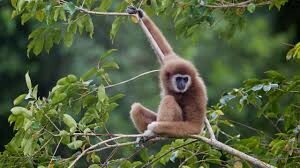 Gibbons are often hunted for consumption and for illegal pet trade, while their forest habitats are cleared by logging and conversion to industrial forest plantations. PRCF currently works in north-eastern Thailand to engage communities to protect remaining Lar Carpenteri Gibbon groups. To this end, we have provided training for Gibbon research and worked with local Thai-Karen villagers to develop species conservation action plans. We are also looking at conservation opportunities of Lar Gibbon in North Sumatra – Indonesia. At this site the aim is to engage local communities in conservation management of the species and its habitat through village forest conservation stewardships.